The CIVIVI C902B Wyvern is the budget friendly answer to the WE Knives Drakon, offering the same stunning visual appeal executed in more economic materials for a handsome knife that you can use without a second thought. 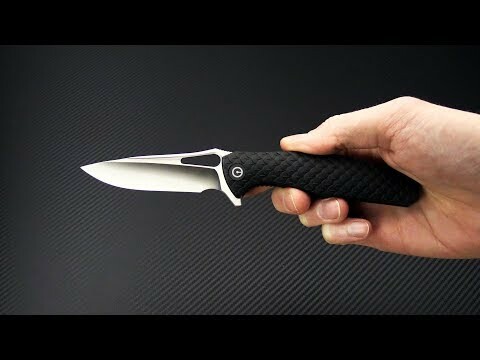 As the name suggests this knife has dragon scale texturing on the streamlined handles for style as well as well as traction, delivering ergonomic comfort and performance for use. This version comes with Black FRN handle scales over steel liners and a satin finished D2 Tool Steel blade. Blade: The hollow ground, satin finished, D2 blade rides on a stainless steel ball bearing pivot for ultra smooth, fast deployment via the blade hole or integral flipper tab. The blade is slim with a full length clip running from the thumb ramp above the blade hole down to the razor sharp tip. This blade is durable for serious use while being fast and maneuverable for finer work with a full size index finger choil for added control. Fullers that run down either side of the blade add a touch of style to this highly utilitarian blade. Handle: The handle design has clean lines that highlight the eye-catching dragon scale texturing while facilitating multiple grip positions. Stainless steel liner construction offers a solid foundation for durability with a simple and reliable liner lock construction for security in use. The Black FRN scales are stylish, lightweight, durable and nearly impervious to the elements making this a perfect choice for every day carry and use.